Arenacross is back! Enjoy seat-grabbing action from some of the fastest indoor motocross racers and freestyle MX stars from across the globe. Kicking off in Belfast, the tour will continue on to The Genting Arena in Birmingham, with the grand finale firing off at Sheffield’s Fly DSA Arena. The fastest motocross racers flock to the six-round series. With bragging rights and a well-paid jackpot up for grabs, the riders leave nothing on the line resulting in knuckle-to-knuckle non-stop racing on the arena-sized dirt battlefield! Cheer on homebred riders as they battle the international superstars from the age of seven up to the professionals. Arenacross also hosts some of the best freestyle motocross riders in the world. See motorsport mavericks whip and flip their bikes 40 feet above the arena floor. And this wouldn’t be Arenacross without the lasers, lights and pyro. Plus, at every event there'll be giveaways, autograph sessions and a chance at each round to walk away with a bike of your own! 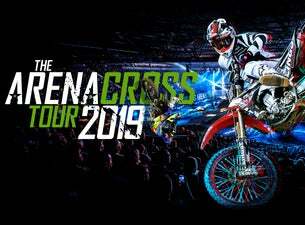 One of the most incredible family shows you’ll ever witness under one roof, Arenacross is back for 2019 bigger, louder and faster than ever before!